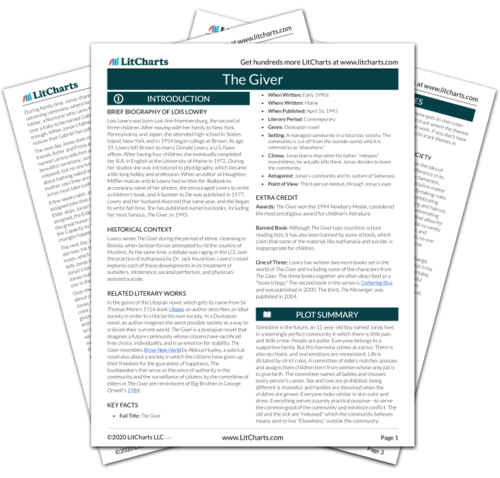 Instant downloads of all 942 LitChart PDFs (including The Giver). 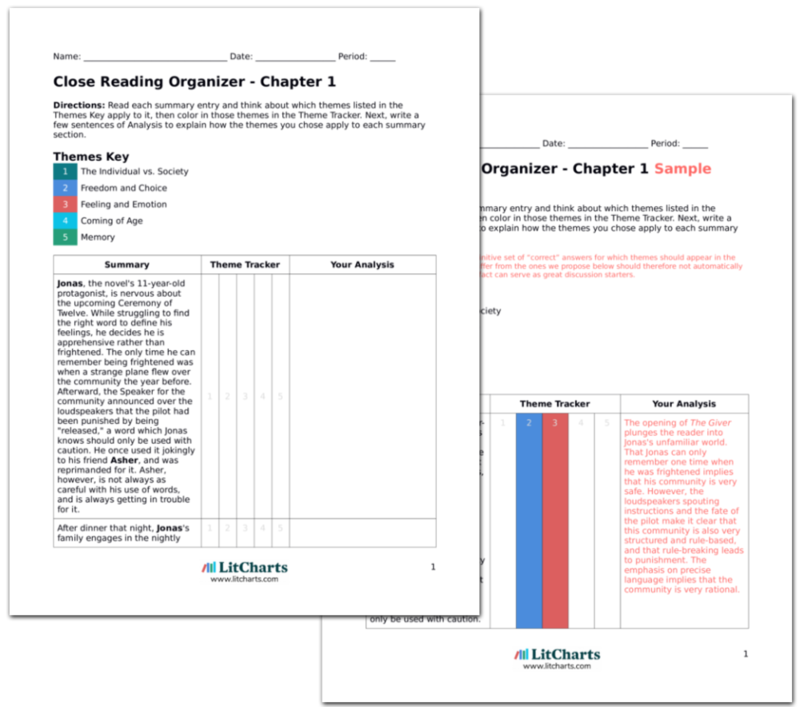 LitCharts assigns a color and icon to each theme in The Giver, which you can use to track the themes throughout the work. One day, it snows, leaving Jonas and Gabriel cold, hungry, and exhausted. Jonas has just a few memories left from The Giver, but he finds one of sunshine and transmits it to Gabriel. Soon, though, the snow makes it impossible for Jonas to bicycle up the hill he is on. He abandons the bike and carries Gabriel. When the memory of sunshine is gone, he focuses on his memories of his friends, family, and The Giver. These memories, and his intense desire to keep Gabriel safe, help him make it to the top of the hill. The hill symbolizes Jonas's final struggle. He must face this struggle without any help (or a bicycle). Yet he realizes he is not alone. Now he has his own memories and feelings to hold onto for strength, and his genuine love for Gabriel to push him forward even though part of him wishes he could give up. When he reaches the top of the hill, Jonas recognizes it. He also sees a sled. Jonas and Gabriel ride the sled downhill. At the bottom of the hill, Jonas sees rooms full of colored lights. He is certain that there are people inside those rooms who keep their memories and understand what love is, and who are waiting for him and Gabriel. From the houses, he hears what he knows must be music, and realizes that the people are singing. Jonas also thinks he hears music playing far behind him, where his old community is located, but he can't be sure. It could be real, or it could be an echo. The end of the novel is ambiguous: the village at the bottom of the hill could be Elsewhere (a community unaffected by Sameness), or it could be heaven after Jonas has died. In either case, Jonas has reached his destination, making choices only he could make. Through the music that Jonas may or may not hear behind him, The Giver makes it clear that Jonas has given his former community the opportunity to make its own choice: to seek out the wisdom that comes only through the experience of joy, love, and pain, or to once again hide from everything unpleasant and go back to the robotic comforts of Sameness. Jonas could give the community the opportunity to choose, but the choice is up to them and out of his hands. Sprow, Victoria. "The Giver Chapter 23." LitCharts. LitCharts LLC, 22 Jul 2013. Web. 16 Nov 2018. Sprow, Victoria. "The Giver Chapter 23." LitCharts LLC, July 22, 2013. Retrieved November 16, 2018. https://www.litcharts.com/lit/the-giver/chapter-23.